New releases for the week of April 16 that are on my wish lists! Under the Table by Stephanie Evanovich- April 16- Suffocating in a dead-end marriage, Midwesterner Zoey Sullivan fled to New York and moved in with her little sister Ruth, a carefree, vivacious beauty with a string of eligible bachelors at her beck and call. Giving herself three months in the city to clear her head and find a direction, Zoey dodges calls from her ex Derek, and distracts herself by cooking and catering a few private dinners and parties. Pursuing her passion for cooking was never an option when she was with Derek, and now Zoey relishes her independence. When Zoey’s meets reclusive millionaire Tristan Malloy, she’s blown away by his kitchen—a marble and stainless steel temple worthy of the culinary gods—and charmed by his impeccable gentlemanly manners. But despite his firm body, handsome looks, and piles of cash, Tristan—a computer programmer—is shy and more than a little socially awkward. Zoey is sure that Tristan has all the right raw ingredients—and she’s the right person to spice them up turn him into a delectable dish. But Zoey’s unprepared for just how well her makeover works. Tristan turns out to be even sexier once he’s gained a little confidence and the right wardrobe. Beneath the gorgeous package, Tristan is a great guy who deserves a woman who really appreciates him. Slowly but surely, Zoey realizes she may have found her perfect match—but does Tristan even know how her feelings have changed? Is that warm look in his eyes gratitude for the new and exciting world she’s ushered him into, or something more? And what will happen when Zoey’s ex comes to town, looking to win her back? Before She Was Found by Heather Gudenkauf- April 16- For twelve-year-old Cora Landry and her friends Violet and Jordyn, it was supposed to be an ordinary sleepover–movies and Ouija and talking about boys. But when they decide to sneak out to go to the abandoned rail yard on the outskirts of town, little do they know that their innocent games will have dangerous consequences. Later that night, Cora Landry is discovered on the tracks, bloody and clinging to life, her friends nowhere to be found. Soon their small rural town is thrust into a maelstrom. Who would want to hurt a young girl like Cora–and why? In an investigation that leaves no stone unturned, everyone is a suspect and no one can be trusted–not even those closest to Cora. The Better Sister by Alafair Burke- April 16- Though Chloe was the younger of the two Taylor sisters, she always seemed to be in charge. She was the honor roll student with big dreams and an even bigger work ethic. Nicky was always restless . . . and more than a little reckless—the opposite of her ambitious little sister. She floated from job to job and man to man, and stayed close to home in Cleveland. For a while, it seemed like both sisters had found happiness. Chloe earned a scholarship to an Ivy League school and moved to New York City, where she landed a coveted publishing job. Nicky married promising young attorney Adam Macintosh, and gave birth to a baby boy they named Ethan. The Taylor sisters became virtual strangers. Now, more than fifteen years later, their lives are drastically different—and Chloe is married to Adam. When he’s murdered by an intruder at the couple’s East Hampton beach house, Chloe reluctantly allows her teenaged stepson’s biological mother—her estranged sister, Nicky—back into her life. But when the police begin to treat Ethan as a suspect in his father’s death, the two sisters are forced to unite . . . and to confront the truth behind family secrets they have tried to bury in the past. Forgotten Legacy by Robin Perini- April 16- On the outskirts of Singing River, Wyoming, a couple dies in a fire that ravages their remote mountain home. Everyone believes it’s a tragic accident—except FBI profiler Riley Lambert. She isn’t convinced, and neither is her fiancé, ex–Navy SEAL turned sheriff Thayne Blackwood. When they discover that the couple’s daughter is missing, Riley’s dark memories of her own sister’s kidnapping ratchet up the urgency to find the girl—before it’s too late. Racing through a maze of deceit and a buried past, the pair find themselves under attack from an unknown assailant. Dodging danger, they follow a tangled web of clues pointing to a forgotten secret that Thayne’s Alzheimer’s-stricken grandmother holds dear. But when their deadly investigation veers too close to home and brings a twisted killer to Riley’s and Thayne’s doorsteps, can they save those they love and stop the murderer before time runs out? 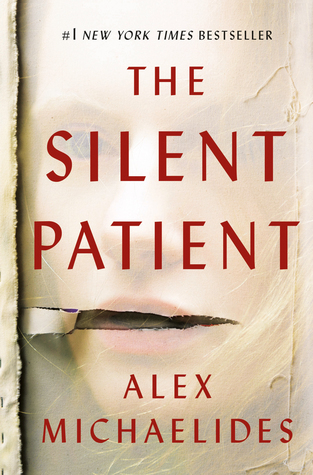 The Silent Patient by Alex Michaelides– Alicia Berenson’s life is seemingly perfect. A famous painter married to an in-demand fashion photographer, she lives in a grand house with big windows overlooking a park in one of London’s most desirable areas. One evening her husband Gabriel returns home late from a fashion shoot, and Alicia shoots him five times in the face, and then never speaks another word. My Thoughts: This was an unputdownable psychological thriller for me. I stayed up way too late trying to finish it. It’s rare that a thriller truly stumps me until the end but this one did. I could not figure out what had happened. When all was finally revealed I was shocked! Even reflecting back on the story in hindsight I still wouldn’t see it coming! The characters were compelling and the mystery was dark. The story was told in a way that had me turning the pages as fast as I could. It was fast paced and I didn’t feel like there were any loose ends that weren’t wrapped up. I’m struggling with how much to say because you really should go into this one blind. Just know that it’s definitely worth the read if you like dark mystery or psychological thrillers. I can’t believe March is over. How? We had a super busy month and it just seemed to fly by at the speed of light! I’m so looking forward to April because after April comes May and then summer break. Ha! Let’s see how I did on my goals for March. 1. Personal Goals- 2 out of 3 isn’t bad! 2. Book Goals- Eh, I tried. 3. Family Goals- I met all these goals! 4. House Goals- I slacked on these a lot! 5. Blog Goals- Work in progress! I’m trying to be realistic about my goals for April because it’s another busy month!